BELMOPAN, Wed. Apr. 1, 2015–Senior officials from the Ministry of Agriculture today met with local rice producers in Belmopan to “discuss the way forward with rice production in Belize” following recent tensions which arose over the proposed importation of the staple grain. Those local producers have been expressing concerns to the Agricultural Department regarding the plans of businessman Jack Charles to import Guyanese rice and sell it for 69 cents per pound, which is almost 50% cheaper than the local product. At the end of today’s meeting, both sides agreed that the “draft revised standards for rice” will be finalized within a month, which suggests that different grades of rice will now be sold at different prices. According to a release that was later issued by the Ministry of Natural Resources and Agriculture, agreements were also made for all rice sold on the domestic market to be pre-packed to indicate origin, quantity, and quality, among other basic packaging requirements. This is expected to be fully implemented within two months. That is more than likely as a consequence of the recent revelation that over 3 million pounds of the same Guyanese rice was imported for just 53 cents a pound – via the Belize Marketing Board – reportedly to make up for drought-related shortfalls, and then passed off by local producers unto unwitting consumers as local rice in September of 2014. There was no public disclosure of the bulk importation, and the local producers simply bought it from the Marketing Board, bagged it in their local rice bags, and then sold it for the controlled price of 90 cents per pound. In their defense, the producers have maintained that it was a bulk shipment of the lowest grade of Guyanese rice and therefore needed further cleaning and processing, which drove up the final cost. They also placed part of the blame on the Marketing Board, for “being guilty of not declaring that there was a need to import to meet a shortfall”, as well as some of the retailers who, according to the producers, have been deliberately “creaming” consumers by elevating the price of rice, which is usually $1.20 per pound – 30 cents above the controlled price – and 50 cents more than the price at which Charles has promised to retail it. 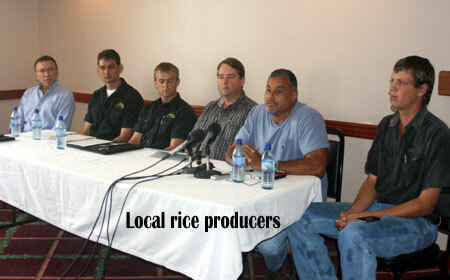 Most importantly, the release said that the discussion commenced for “a reduction of the price of rice to consumers with particular emphasis on a reduced price for a more affordable grade of rice to the public” which, in essence, means that in order to compete with Guyanese rice, a lower grade of local rice will inevitably be offered. The Ministry concluded that the necessary cost of production survey and other studies will be completed and a revised price structure will be finalized within one month, which means that there will soon be cheaper locally produced rice, the price and grade of which will be known in a month. Although Charles has half-a-million pounds of rice waiting to be shipped from Guyana, local government officials had initially refused to grant the Indian importer the permit he needs to bring in Guyanese rice which, he said, would drive shelf prices down and amount to major savings for shoppers. Authorities believed that it would have decimated the local rice industry and put producers out of business, but after he went public with his plan, they later decided to conduct a “review of the rice sector” after those local rice producers were accused of gaining “unfair and unjust profits” through monopolization of the Belizean market. Charles said that he intends to bring in six containers initially, and while Government was reluctant to grant him a permit, under the Treaty of Chaguaramas (which was first signed by members of CARICOM in July of 1973 to govern the Caribbean Single Market and Economy (CSME)), there was only so much they could have done to stop importation from a CARICOM country.